"In New Zealand, do they allow drink-driving?" I was drunkenly asked on the third day of the Year of the Horse. No, I answered but then it isn't allowed in China, either, which might make you wonder why I was asked. But we were drinking, with numerous drivers getting poured more and more red wine indiscriminate of their status as drivers. "Don't worry, we have three policemen drinking with us tonight," the host winked with a cheery drunk grin. Of course the policemen were not going to stop our incapacitated drivers plowing their cars into walls, but at least no-one was going to get fined or embarrassed. I don't know how many vehicles I've sat in with a drunk driver at the wheel. Often it might be a tired drunk driver, too, because not many people have cars and those that do are the transport for the evening. The host of that evening (a high school reunion party) is a regular feature of my calendar of events. He is a school teacher by profession but now has a very profitable side trade in Chilean wine, which he'd brought at least two boxes of to the evening. "I know you like baijiu, Daniel; I've got some in my car! It's China Railways Wine," he said after I was already very comfortable. I declined. "We haven't had your wedding wine. You have to drink with all of us!" Both I and one of the policemen had got married but without a banquet in Qingyuan. This has been a source of joking and maybe even sincere gripes whenever I've gone back. The wife of the policemen made a vigorous and rather loud defense of her husband, and I was protected from needing to drink a class of wine with every person at the table. Many of those at the table came to me to drink anyway. "In New Zealand we wouldn't knock this kind of wine back," I say as I down a full wine glass with a gentleman I have some acquaintance with (another policeman). 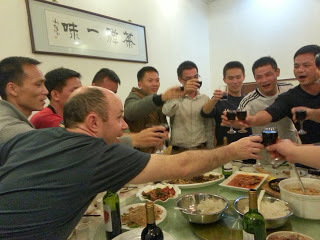 One of the myths I've sought to dispel this trip was that "Cheers" does not mean "gan bei" (dry your glass/bottoms-up). It's not working. The second day really also shows how far China has come: there are traffic jams in all the little villages as cars, almost unheard of a few years ago, crowd out the roads an available parking space (virtually none). When I came to Qingyuan, the greater family had access to one car (a cousin could use a business car) and he was the only one who could drive; now there are three cars in the greater family and about six people who can drive them. That pattern has seemed to have occurred elsewhere. My first year in Qingyuan only witnessed a few cars. Now they're all through the little villages. The third day is not a day for visiting relatives so a perfect day for the reunion. The fifth, sixth and seventh days were dinners and drinking that really made me rather queasy about the sight of any food or alcohol, but they were the completion of family events in each corner of "the Qingyuan triangle". The Triangle might exist in other places in China, but could be unique to our family, it goes something like this: In the Mao era of China some people were considered to have a bad background if their parents or grandparents had been landlords in the pre-Communist times (1949). This could affect your life in so many ways. A-gung, our name for grandfather, was the son of a landlord before their lands were stripped of them and the harassment that goes with old recriminations stretches a long way. His children struggled to find husbands and wives because of this baggage. And it was a problem all over China. Neighbouring villages had families of former landlords, too, in a similar predicament. In what must have been an elegant solution for the time a triangle was made by daughters from one corner marrying into another corner, thus the towns of Waangho, Daaiyau and Gwongtau are linked for me. From a foreign point of view it smells like the arranged marriages with the deal brokered over a dinner of chicken with firey alcohol to ease the awkwardness. But everyone is happy, now at least, and the families go on and prosper. All of the dinners in the Triangle are great because they're the uncles and cousins I know best. There are usually jokes I can follow. Everyone is smiling. I guess it's what the season is meant to be about. We left on the afternoon of the seventh day of the Year of the Horse, the body yearning for some rest from the food and drink. It's got it now. Time to relax and have a great new year~!